There very few brands in India that provide in-fashion affordable jewellery. There are few in-house brands like Ginger, Toniq, and fewer brands online that are cater to this unique accessory loving clientele. Forever 21 is a one-stop shop that satisfies your accessory cravings. Midi rings, body chains, geometrical jewellery, you name it, they have it. I somehow prefer their online store in comparison to their brick n mortar one. Anyone who has had an experience would agree, as the stores are chaotic to say the least, and it takes hours and hours browsing through the stuff to find things that you like. I recently placed an online order (multiple, to be frank). With the new stocks added daily to the New Arrivals and Sales section, one is tempted to log into the website and check for good deals every single day. I made few orders over the last few weeks, and thought it would be a great idea to do a collective accessory haul. I purchased few statement necklaces as well as few dainty and boho pieces that I can dress up or dress down with. This is what forced me to place a second order. The antique gold finish, dual strand coin necklace features a cute baby elephant, a turquoise tassel, and a tusk-shaped pendant. The upper strand has a Moroccon inspired pendant. A long layered necklace featuring turquoise and golden beads. Very Boho looking neck piece. Team it with a white lace shift dress and a fedora. A choker that features elephant heads with rhinestone trim. You will realise that I went a lil cray-cray over elephant inspired jewellery this time. A long delicate chain necklace featuring beaded trim.I quite didn't like the trim. 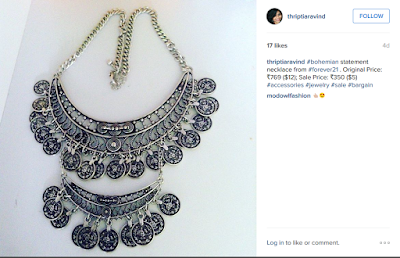 Instagram is filled with such boho neckpieces and the price ranges from 1000-2000. You won't believe how much I got this neck piece for! A very delicate statement neck piece that features a mix of rhinestone and faux gemstone triangle. You can wear this with a plain tee to dress it up. Somehow, these remind me of bees. Exhumes a vintagy boho charm, the favorite buy off the lot. This layered necklace has five layers of faux pearls and faceted beads. One of the links came broken, aaghr....This statement piece would look great with an A-line dress and high heels. A short three layered faux pearl necklace that features splattered paint finish.Very Parisian chic. I can totally visualize wearing this necklace with a A-line, fit and flare dress. 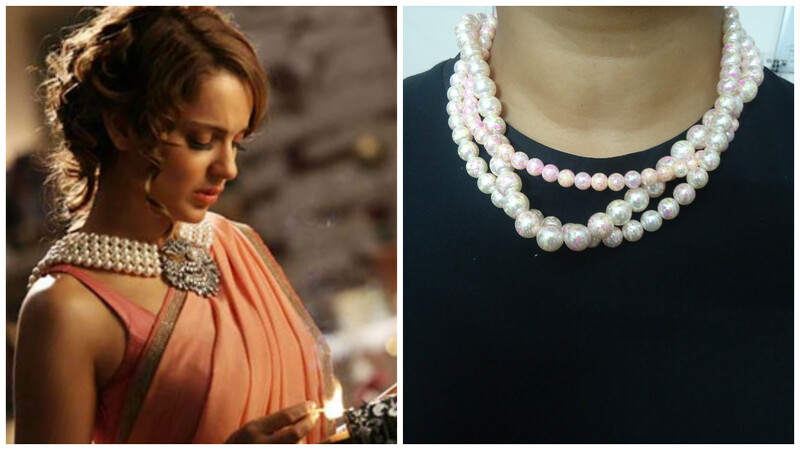 Does this remind anyone of Kangana Ranaut's necklace from I Love New Year? PS: Thanks to Mr. G for helping me out with clicking the pictures.